Have you ever wanted to increase the chances of winning the lottery? This unique software bundle contains intelligent algorithms that could very well enable you to strike it rich. magayo Lotto has received a massive number of positive reviews. There is no charge to download the free version. Access to advanced features will require a one-time payment. It is very difficult to predict larger jackpots associated with a wide array of numbers. magayo Lotto is a unique application in the fact that it employs "intelligent" analyses in order to observe recent lottery trends and historical data. While this approach is highly scientific, the intention is simple. It is meant to increase the odds of a player matching his or her numbers to those which will be chosen in a subsequent drawing. Frequency charts and the relevant numerical groupings will displayed in graphical form; allowing players to more effectively interpret and improve their existing strategies. This bundle is said to support well over 350 different games in more than 75 different countries. magayo Lotto is not intended to represent a "sure-fire" way to win a lottery drawing. It is simply meant to provide additional insight so that players can make informed decisions. Many online review portals have given this application a five-star rating. All statistics can be saved as CSV files. 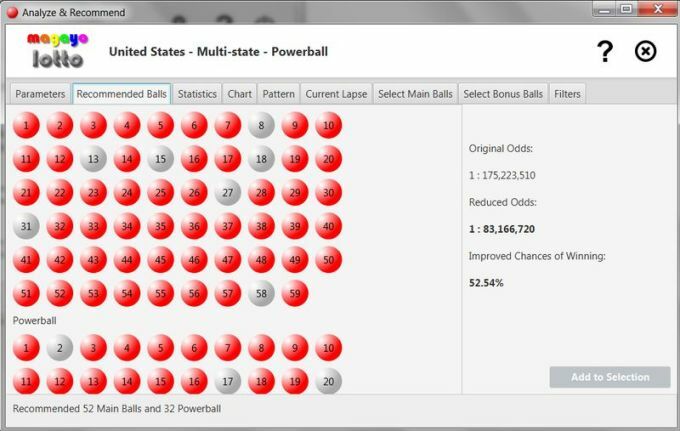 magayo Lotto is a powerful and yet easy-to-use lottery software for Lotto, Powerball, Thunderball and Toto games. It generates the recommended pool of lottery balls, thereby reducing your odds and increasing your chances of winning! Various statistics with graphical charts are also available and you can generate tickets with the odd and even filter or apply a wheeling system from over 650 wheels. The lottery results for the supported lottery games can be automatically downloaded and updated with a single click. The supported games include games in Anguilla, Antigua & Barbuda, Argentina, Aruba, Australia, Austria, Azerbaijan, Barbados, Belgium, Belarus, Belize, Bermuda, Brazil, Bulgaria, Canada, China, Chile, Colombia, Costa Rica, Croatia, Cyprus, Czech Republic, Denmark, Dominica, Dominican Republic, Estonia, Finland, France, Germany, Ghana, Greece, Grenada, Guyana, Honduras, Hong Kong, Hungary, Iceland, Ireland, Israel, Italy, Jamaica, Japan, Kenya, Kosovo, Latvia, Lebanon, Lithuania, Luxembourg, Macedonia, Malaysia, Malta, Mauritius, Mexico, Mongolia, Morocco, Netherlands, New Zealand, Nicaragua, Nigeria, Norway, Peru, Philippines, Poland, Portugal, Puerto Rico, Romania, Russia, Saint Kitts and Nevis, Saint Lucia, Saint Vincent and the Grenadines, Serbia, Singapore, Sint Maarten, Slovakia, Slovenia, South Africa, South Korea, Spain, Sweden, Switzerland, Taiwan, Trinidad and Tobago, Turkey, Uganda, Ukraine, United Kingdom, United States, Uruguay, US Virgin Islands, Vietnam, Zambia & Zimbabwe. magayo Lotto is extremely easy to use. You just need to select your country and the lottery game to start playing. Draw results are updated with a single click. There is no time expiry for using magayo Lotto. What do you think about magayo Lotto? Do you recommend it? Why?